There’s nothing wrong with growing food in our own backyards and on our farms, or catching it from the sea. Eating in season, eating what we grow, raise, catch, forage, and hunt has been a way of life for many Vineyarders for a long time. There’s something about living on an island that makes us an interesting lot of self-starters bent on self-sufficiency, with a good dose of Yankee ingenuity on the side. But what is new about this Next Big Thing—aka the local food movement—is the genuine resurgence of family farming and a fever pitch of interest in eating and cooking closer to home. From the White House to public schools, from cities to rural towns like ours on the Vineyard, more people are growing more food for their families and for their communities. 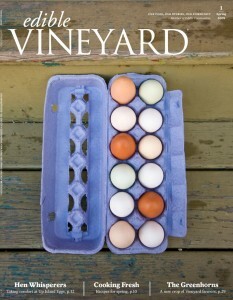 In Edible Vineyard we want to bring you interesting stories about the Island’s local food scene. Stories about the farmers and fishermen—as well as the cooks, the chefs, the grocers, and you, the eaters. We’ll take a peek behind the curtain about how the food on your plate got there—from nose to tail, cheek to fin, farm to fork, and everything in between. It’s that thing called food that nourishes and sustains our families and our Island. This is what connects us to the land, to the sea, and to each other. In every issue we’ll bring you tried-and-true recipes. In this edition, we’re cooking with Spring’s pink and green finest—bright rhubarb and nourishing greens. Along with “Cooking Fresh,” every Edible Vineyard will carry departments such as “In The Dirt” and “The Wild Things” that’ll give you real-life tips about raising and gathering more of your own food. In our premiere issue we feature the Martha’s Vineyard Agricultural Society—how it has shaped and grounded the Island’s agrarian heritage and where this steadfast organization is going in the future. Which leads us to the next generation of farmers, “The Greenhorns.” In this photo feature we take a snapshot view of these young tillers of the land who do what they do with generous help from people like Up Island egg-experts Katherine Long and Tom Vogl (the subject of our third feature). This West Tisbury couple opens up their chicken coop and home, freely sharing in- formation about how to raise chickens, and more importantly, how to talk to them. Three times a day, every day, at breakfast, lunch, and dinner, you have the chance to make a difference. By eating locally, you support your neighbors, the farmers, the fishermen. So cook a little more. Come together over a meal. Break bread. Say grace (if you do). In the end, it’s these smallest things that make the biggest difference. Truly.